Here's another from the Mansell box of pics - shows Geoff Studdert, a Dublin university student with a 588 preparing to have a good time on the sand. Note the bits and pieces that were deemed too heavy and were removed from the bike. 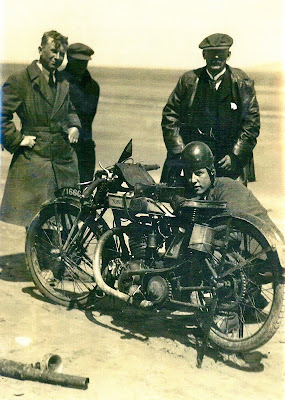 It has a single spring clutch and these did not become standard wear until late 1925 so the photo probably dates from 1926 or 1927. Roger: "I've done a fin count and there could be too few so the bike could be a 490cc Model 18, not a 588cc Model 19".